Motorsports can be found in little cracks all over the United States, but only some events can be considered truly international. For mainly historical reasons or for their crazy stories, these ten racing events have become the ten most globally important ever held in America. America’s first race was held in Illinois back in 1895. It was sponsored by the local Chicago Times-Herald newspaper and named the Chicago Times-Herald Race. The race was used an attempt to nurture and grow the little seed that the automotive industry was in its early days as well as generate readers for the main sponsor. The race’s course was 54 miles long. It started in Chicago, IL, went out to Evanston, IL, and then returned back to Chicago. Because of legal issues, cars not being built on time, and poor weather, the race ended up being postponed once. When the Thanksgiving race day actually came, there were recorded snowfall levels of up to 24 inches on the ground. Only six out of almost 80 competitors made it to the starting line and just two finished. The winner was recorded to have maintained an average speed of 7 MPH and cleared the course in seven hours and 53 minutes. Its two-car finish number might not seem like much, but to many this race was to be considered a major success, just because it actually happened. German-built cars constructed by Karl Benz were on the entry list, among American car builders such as Elwood Haynes and Charles Duryea. That was just about as international as it was going to get back in 1895. While it’s not on the calendar anymore, Watkins Glen F1 races were pretty big races for America in the ‘60s and ‘70s. They also claimed the lives of two F1 drivers, Helmuth Koinigg and Francois Cevert. Also unfortunately Phil Hill, an American who won the ‘61 championship, missed the opportunity to race in front of the home crowd because Ferrari opted to not race at Watkins following the death of their driver at Monza the race prior. Lot of history at Watkins. For over 100 years the name Bonneville has resonated both inside and outside of the motorsport community as official place you go if you want to go fast. There’s nowhere else like it in the world. On its salt flats located in the middle of Utah, speed records are made and records are broken, both on the regular. It’s just what happens on the Salt Flats. For many teams and race fans the Daytona 24 is considered to be the first big motorsport event of the year. With the track shared between Daytona Prototypes and various GT cars for 24 hours straight, the racing is grueling, amazing to watch, and like very few other events that take place in America. Back in the ‘60s when it was more on top of the international racing platform, the Ferrari community was so proud of taking a 1-2-3 finish at Daytona ‘67, that their 365 GTB/4 road car was unofficial nicknamed Daytona. 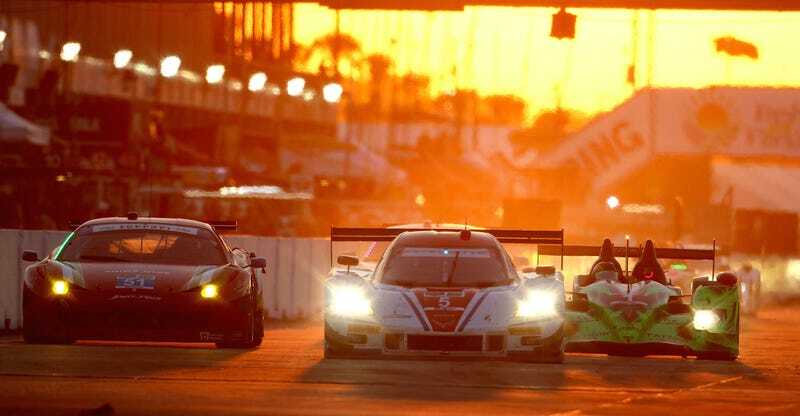 In the 2015 IMSA Tudor United Sports Car Championship the 12 Hours of Sebring came right after Daytona. And by “right after,” I mean almost three months later in March with no other racing in between. This of course leaves a good amount of time for testing, and uh, a whole lot of race teams attempting to pick up where they left off after the 24 hour enduro. It’s quite the spectacle. It’s a shame that the FIA’s World Endurance Challenge LMP1 cars don’t compete in the 12-hour like they have in the past. It seems like the cars and the teams both love it. Maybe just not the course’s world famous suspension-rattling surface that rattles the car to hell. The greatest endurance race this side of the earth (save for LeMons lol). Top competitors from all over the world come to race, and this ensures unpredictability: a freaking GT car won this year due to torrential rain. Follows almost the exact rules as the greatest motor race in the world, for 10 hours straight (when it isn’t pouring like hell) at one of the best tracks on the states. The cars are insane, the 12.4 mile course is both treacherous and otherworldly, and its first sanctioned running occurred almost 100 years ago. It’s the most important and well-known hillclimb event in the world. Long live Pikes Peak, and those that dare to attempt to conquer it. The Vanderbilt Cup, it was the first major cup race held in America. After three years racing on dirt tracks around Nassau County, the 1908 edition featured the first ever roadway designed strictly for automobile use, which would host a further three editions. The Cup then moved to Savannah, Georgia, Milwaukee, Wisconsin, Santa Monica, California, and San Francisco, California, before racing ended due to World War I. The Cup was revived in 1936 at the brand-new Roosevelt Raceway, featuring a track that was insanely twisty for the amount of land it was on. This picture shows it decently well. The 1937 Cup event featured a track that was significantly more open, allowing the cars to reach a much higher top speed, as seen in the below program and following pictures. After this event the Vanderbilt Cup again went on hiatus. The Cup returned once again in 1960, and again at Roosevelt Raceway. However, by this time the facility was a horse harness racing facility and the older automobile race track had been demolished; The 1960 Cup was held on a circuit laid out in the parking lot of the horse track and was ran to Formula Junior regulations. After yet another brief hiatus, the Cup became part of the Can-Am races, with the Cup being held from 1965 to 1968 at Bridgehampton Race Circuit, also on Long Island. And at the conclusion of the 1968 race, the Vanderbilt Cup went on another hiatus, one that continues today. The United States Grand Prix at Circuit of the Americas is the United States’ only Formula One race. After the final USGP occurred in 2007 at the Indianapolis Motor Speedway, it was unclear if the U.S. would ever see the top-level open-wheeled racers again, until the whole Austin, Texas idea came along. In May 2010, after receiving bids from several other already-existing tracks and balancing offers that proposed other new courses, like the potential New York skyline track which never happened, the Austin track was chosen and track construction began soon after. Now whenever us Americans want to go watch immature, high-strung racing drivers go at it for a while, we don’t have to travel too far. Don’t take that for granted, because with all the rumors of financial-issues and the possibility it might not happen next year, who knows what the 2016 season could bring to America, if anything. The Indy 500 has been able to comfortably build its status as the biggest single day sporting event in the world throughout its 99 runnings. It features drivers from around the world with completely varying levels of experience and training. 1950 until 1960, the race even counted toward the Formula One World Driver’s Championship. When each driver hops in their open-wheeled racers and start off toward the 200 lap checkered, the racing becomes real.